of the product. Either ask your surgeons or work with your facility's staff to create a policy to follow-up with patients in the months, and even years, after surgery to check for complications such as chronic pain or recurrent hernias. It may seem overwhelming, but tracking this data will not only let you focus on streamlining your inventory, but also will potentially let you improve your patients' outcomes using the principles of clinical quality improvement (CQI). 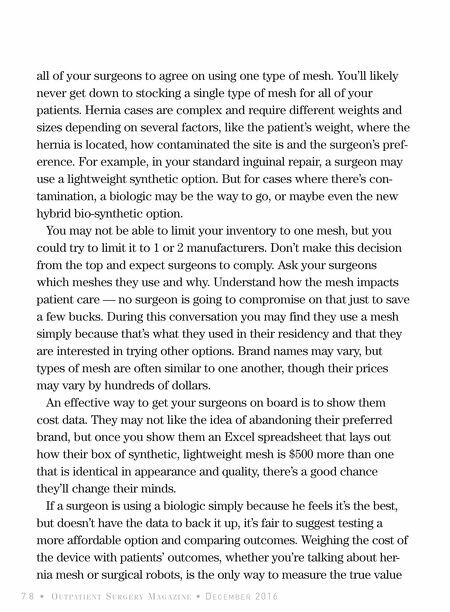 Once you know what mesh you're looking for, then it's time to talk to your vendors. Don't be afraid to negotiate. Maybe you agree that you'll purchase 80% of your stock from them at a discounted price. Don't let the doctors' relationships with vendors dictate this process. Stay vendor-neutral and focus on quality, cost and patient outcomes. 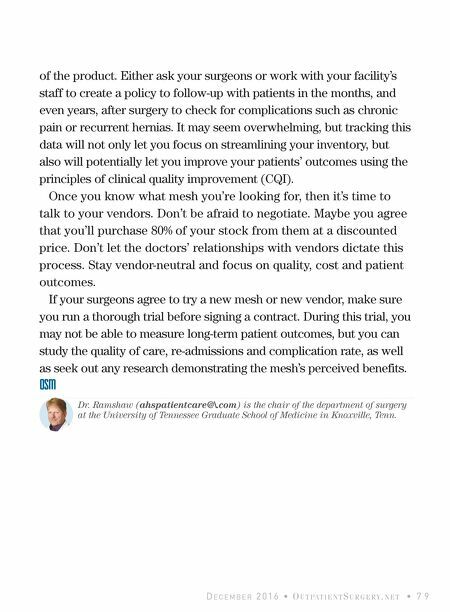 If your surgeons agree to try a new mesh or new vendor, make sure you run a thorough trial before signing a contract. During this trial, you may not be able to measure long-term patient outcomes, but you can study the quality of care, re-admissions and complication rate, as well as seek out any research demonstrating the mesh's perceived benefits. OSM D E C E M B E R 2 0 1 6 • O U T PA T I E N TS U R G E R Y. N E T • 7 9 Dr. Ramshaw (ahspatientcare@\.com) is the chair of the department of surgery at the University of Tennessee Graduate School of Medicine in Knoxville, Tenn.